Today is one of those slow days. Is it the extreme coldness outside ? It is -5°C and a North wind just freezes everything. Nothing seems to move apart from an occasional crow gliding over the forest or small birds dashing from the roof to the nearest tree in the garden. The house is quiet too, everyone went off early, and I have been left with a rare and precious gift : silence. It is not as if I did not like sounds, the usual music of life but sometimes it just seems too noisy to me. Radio, TV, telephone, cell phones, works on the road or on a building site… When you stop for a while and really listen, can you hear silence around you ? I am lucky because often I can and today is one of those days, wrapped like a present. I can hear myself think and it is a beautiful inner feeling. I would like to share with you some quotes and thoughts I read every day in a little brochure called “The Monastic Way”. Most of them are from Joan Chittister. This month it is all about “silence”. Silence frees us to be ourselves again. It gives us the opportunity to hear out what we ourselves really think about anything. It saves us from having to borrow our opinions. Silence is the ground for a good relationship. When we listen to the other, we get to know them and they get to love us. It is silence that brings us into intimacy both with others and with God. “Silence writes Edith Wharton, may be as variously shaded as speech”. Some silence is hard and bitter. 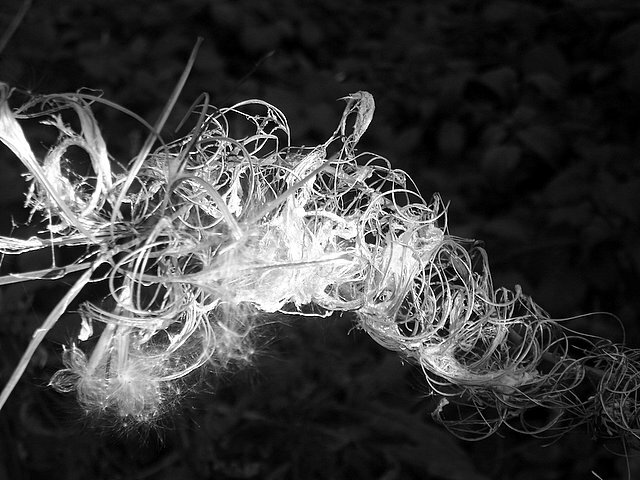 Some silence is soft and pliant. Some silence is thoughtful and searching. Some silence is calm and receptive. Some silence is cowardly and weak, Each of them has a purpose and an end. Choose wisely. Silence requires us to attend to the turmoil within us. It refuses to allow us to ignore our own greatest questions in life. Silence is not a sign of the death of us. It is the sign that something else is growing in us which, if we nurture it, will finally express itself as a finer edition of ourselves. The world is not waiting for more noise from us. It is waiting for us to say the truths that can only be born of Silence. There is no virtue in keeping Silence in the face of injustice. Carol Rittner, RSM writes, “Silence always helps those who cause the suffering, never the victim”. Alice Walker writes “No person is your friend who demands your Silence or denies your right to grow”. Constant activity does no more than inactivity. There are some things in life that can’t be forced and can’t be heard in the midst of noise. 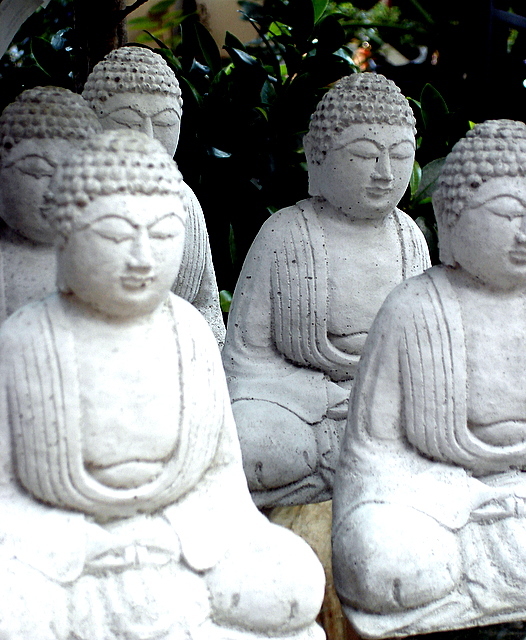 “Sitting still”, the Zen master teaches, doing nothing. 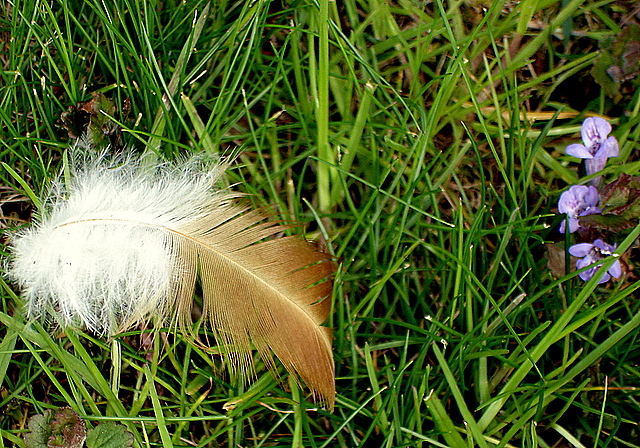 Spring comes and the grass grows by itself”. I know many of us live busy, noisy days, we cannot always avoid it. But I wish everyone would receive this wonderful gift of Silence or/and find in your heart your own silence. One thing I love to do while travelling is visiting market places. Especially in Africa. I used to live in different African countries. Markets are the places where you meet people, you hear the music of various languages, you see the eating habits, you smell unknown food or wonder at local medicines. It is a place to learn so much about a country and its people ! If you look for something you cannot find in any shop, just go to the market, someone will help you find it. You also learn how to bargain : a must ! Since I have always been interested in fabrics, a visit to the tailor’s shop is a priority. The amount and variety of materials that are sold on market stalls always fascinates me. 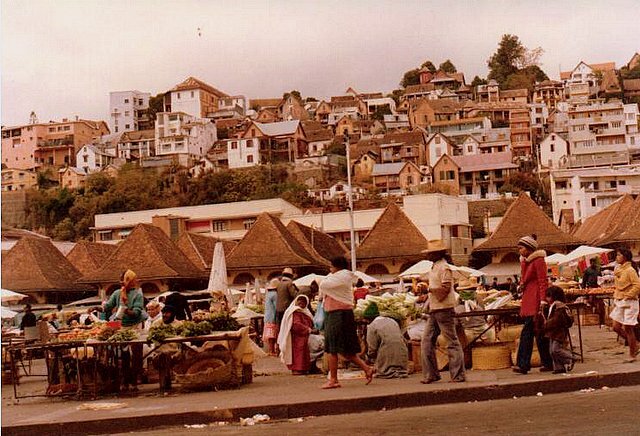 This is the market place (or Zoma in malagasy language) in Antananarivo, Madagascar, a fabulous place to get lost. 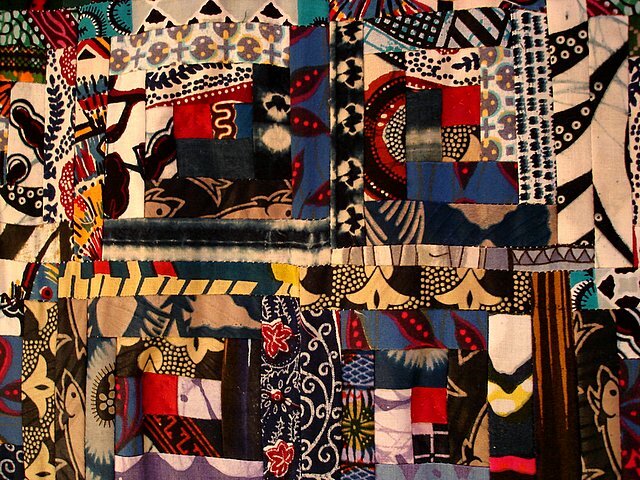 African fabrics, mostly in coton, are extremely colourful and original in their patterns. Many of them have their own designation : “palm, vines, my rival’s eyes, comb, shells, my foot and your foot, the prosperous husband, etc…” and many more very descriptive and sometimes funny names. I immediately fell in love with those bright materials and bought quite a lot of small or larger pieces which I used for quilting. Friends offer me presents of fabrics, tailors are happy to give me the left-overs of what they sewed. I even receive worn clothes that my African friends are happy to share when they get new ones ! Nothing is wasted. 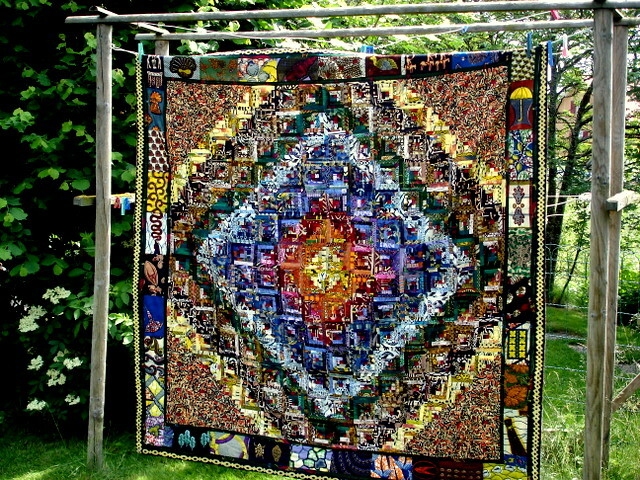 A few years ago I sewed this “African Mosaic”, a log cabin pattern (2m20x2m10) with bits and pieces of many materials I had bought or received during several stays or journeys through different countries. These fabrics were made in Madagascar, Kenya, Burundi, Cameroun, Mali, Niger,Tanzania, Rwanda, Nigeria, maybe elsewhere, I don’t know. It is one of my favourite and precious souvenirs of the people I met, the places I visited, the wonderful moments I spent on this great continent. Here are some details of my African Mosaic : Each square of this log cabin quilt is 10x10cm and there are about 200 of them. Each one unique. 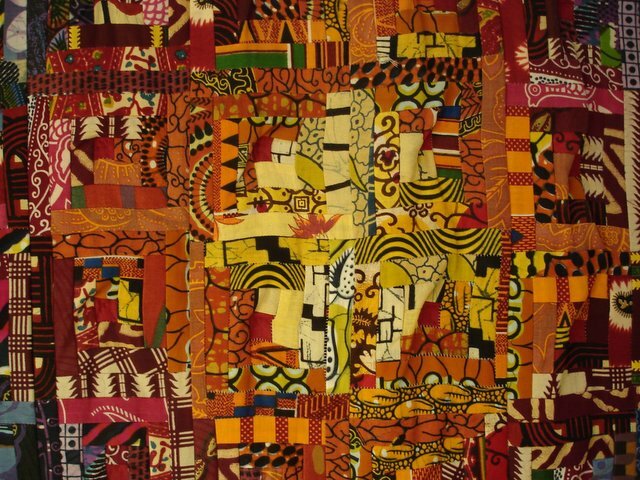 This is the very center of the quilt, golden, bright and warm as the sun that shines in Africa. Photographs and interviews by Brian Lanker, Edited by Barbara Summers, Foreword by Maya Angelou. A precious gift I received years ago from an American friend in Central Africa. Seventy-five wonderful women are presented through photographs and interviews. Each person recalling a special event in her life. Each of them in her own language, accent and with a great openness. Barbara Summers writes :”… A truly beautifying discovery for me was to find so much love in anger. It was a fist-up, death-defying love that challended the unfair conditions of life and muscled in on injustice as it nursed both sides of a nation. Valiant and vulnerable, these women were there”. In this time of celebration in the United States, I took this book out of one of my bookshelves and slowly turned its pages with admiration, respect, gratefulness. And deep emotion. Looking at the Inauguration Day’s celebration on the Swiss TV, I saw some beautiful women’s faces and expressions in the public listening to their new President. I saw their shining eyes and huge smiles, I saw and heard their cries of joy and encouragement. I saw different silent forms of happiness, tears, attentiveness to every word and movement. Prayers. Thankfulness. Unforgettable moments shared miles away. “In fact, all of the women in this book have dreamed of a world not only better for themselves but for generations to come, a world where character and ability matter, not color or gender. As they dreamed that world, they acted on those dreams and they changed America. This celebration of sisters is not an attempt to elevate or lower any segment of society, it is merely an opportunity to savor the triumphs of the human spirit, a spirit that does not speak only of black history. My greatest lesson was that this is my history, this is American history”. Thank you Rosa Parks, Eva Jessye, Maxine Waters, Clara McBride Hale, Maya Angelou, Ruby Dee, Marva Collins, Septima Clark, Mattie Morris Losey… and so many others. Blue, white, red, those are the colours of many countries’ banners around the world : France, my neighbour country is the first that comes to mind. Then a little further are the Netherlands, Iceland, Norway. Further still Liberia, Costa Rica, Australia and many more can claim the same colourful trio. 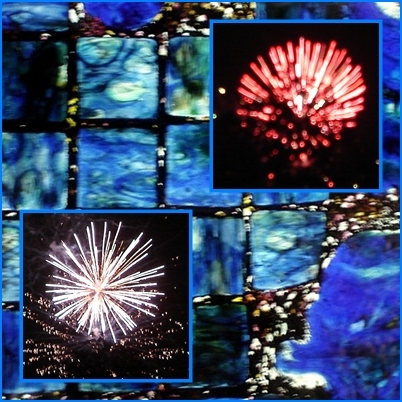 Yet there is one in particular that I thought of a lot as I put together this mosaic made of a blue stained glass window and fireworks. The nation I thought of is the United States of America. Tomorrow, January 20, 2009, is a great, a historic Celebration Day in a beautiful city of our blue planet, Washington, DC. In a few hours these colours will shine high and bright for the Inauguration Day of President-Elect, Mr. Barack Obama. An immense crowd is converging to the capital from all over the country as well as from the whole world. An irresistible wave of people who just want to be there, to be part of these great moments of joy, of hope, of overwhelming emotion. The images I just saw on TV are just fascinating. A glimpse only of what tomorrow will look like. Tomorrow will be a long day. There will be unforgettable visions, words to remember and share. There will be this personal inner feeling of belonging to a future to be created together. Of course there will be joy, tears, laughter, attentiveness, gratitude. Surely there will be faith and hope, the sort of faith that makes you believe in life and in the changes everyone is hoping for. Green, they say, is the colour of hope. But let’s say that tomorrow there will be three colours for Hope : blue, white and red ! Happy, Joyful, Wonderful Inauguration Day ! Mid-March in Moscow, the roads of the city were still bordered with heaps of wet and dirty snow, the sun had been scarce and timid for months, the temperatures still low. During a vacation, I felt like heading South for a while and spend a few days in Central Asia. 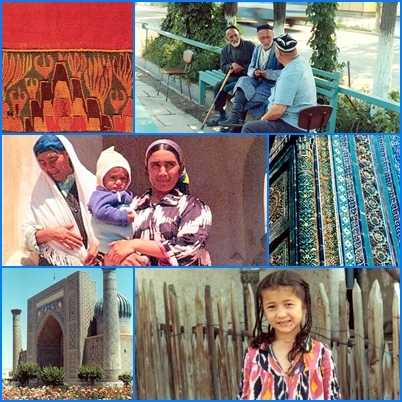 I chose the Republic of Uzbekhistan for all I had read about Samarkand, Bukhara, Khiva, the Silk Road, the famous astronomer Ulug Beg, Tamerlan’s loved wife, Bibi Khanum and more. Those ancient and brilliant civilisations that I had been dreaming of learning more about and seeing what the present cities looked like. I think the Aeroflot flight took about 6-7 hours from Moscow to Samarkand. It was my first flight outside the Russian capital since I had arrived there in the late Fall. A great excitement ! As soon as the plane landed and the doors of the Tupolev were opened, all passengers were welcomed by Spring. We had left snow and a cold Winter in Moscow and found sunshine, flowerbeds, a sweet scent of roses in the parks, along the roads leading to the center of Samarkand. What a joy ! I will never forget my first day in Central Asia. It looked definitely like another continent to me, one of colours (the clothes Uzbeks were wearing as well as the blue mosaics covering many ancient buildings and medresse, islamic schools). A world of scents I discovered going to the market, so many more vegetables and fruits than in Moscow at the same season ! I bought peaches, grapes, figs, even cherries if I remember well. I ate spicy roasted lamb kebabs in small shops along the streets, I loved drinking glasses of a strong black tea in a “tchaikhanas” (houses where tea is served). I just enjoyed strolling around, trying to find my way in the narrow alleys leading to hidden palaces and antique ruins. People were friendly and eager to meet foreigners at that time but talking to them was a bit difficult; my Russian knowledge was still poor, I did not know any word in uzbeki arabic. Sometimes I would find someone understanding a bit of English or German. But still I was welcomed anywhere I went and helped and guided as much as possible. It has been a long time since my travel to Uzbekhistan, politics and new ways of life brought changes there too, good or less so. The Uzbekh Republic no longer belongs to the Soviet Union, wars have been raging at its borders, time surely has left its marks on this ancient world like everywhere else. My memories of this journey (far too short) to the ancient Uzbekh cities remain filled with admiration for all its historic figures, the architecture of its monuments that bears witness to a prestigious past. And last by not least, the warm welcome I received by the people I met. Ulysse was my grandfather, one whom I suppose everyone would wish to call “grand-papa”. His origin was Swiss-Italian. His father, a sculptor, came to the French-speaking part of Switzerland in search of work, which he found in a small town where my own grand-father was born. As far as I remember, my souvenirs of Ulysse were those of a kind, patient, humorous and sociable person. He used to sit for hours in his “grand-father’s armchair”, reading through his very thick glasses, oblivious of everything happening around him. Lost in his own world. He read whole bookcases. Mainly history books. They were about the history of the canton he was born in (Valais), and of its people. 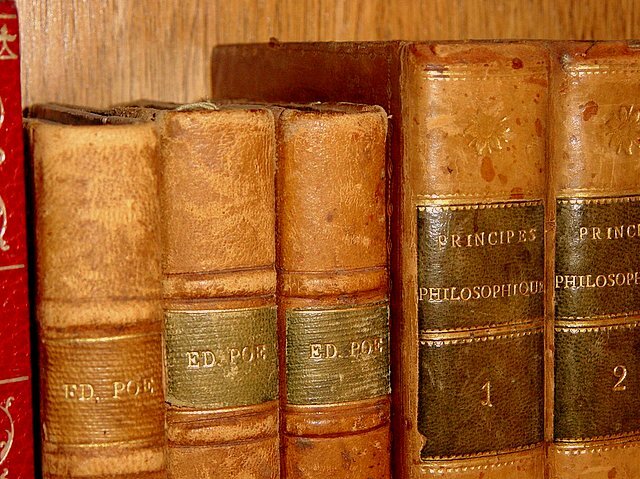 He collected ancient books too and, when money permitted it, he had some of them bound by Léon, a good friend of his, a bookbinder who loved books and treated them with the same respect and admiration as Ulysse did. This soft, scented leather enchanted me whenever Ulysse showed me his recent discoveries. Before he passed my grandfather gave me something precious : many of his history books and the wish to learn more about it. He also gave me the love of books, of reading and writing. I was lucky to receive his old armchair too. When I sit there, a book in my hands, not a day passes without thinking of my grandfather. With such gratitude and happiness that our paths crossed. Hello and welcome to my blog ! Happy New Year to everyone ! I am Isa from Switzerland. This is from this spot in the Swiss Alps that I saw the first day of 2009 coming, the sun lit up this mountain on the opposite side of the valley and the day started beautifully. A sign maybe that this new year may be as bright as the moments experienced up there ? Who knows… There will be joy and sadness too but let’s wish that Hope will always be present. And Peace too. The kind of Peace that starts in your heart and spreads all around. 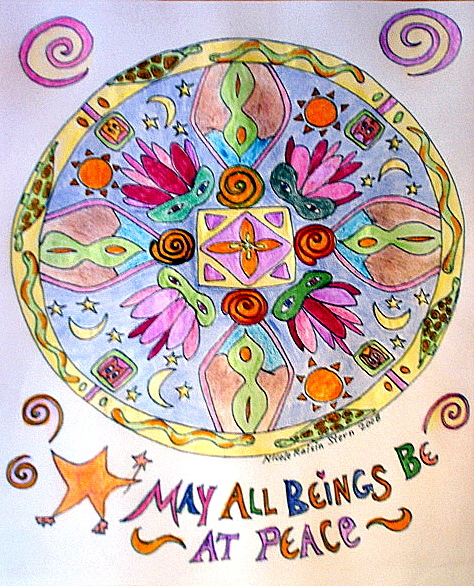 These are my wishes for you and yours wherever you are. The cosy chalet was almost snowed in. Nothing but silence, occasionally the sound of a crow or a blue jay. Barely a few tracks, animals, snowshoes, skis. 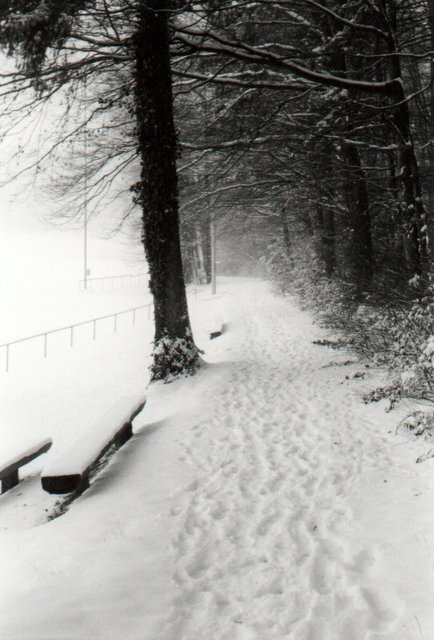 Cars were not exactly welcome on that morning, snow had fallen all night long and paths were invisible. A slow start of the year, peaceful hours to enjoy the present moment. There were quiet talks around the breakfast table, a smell of coffee and toasted brown bread but mostly the amazement and utter pleasure to find oneself in such a unique landscape, a snowy terrace between sky and earth with mountains as neighbours.